Montréal, May 30, 2017- Yorbeau Resources Inc. (TSX: YRB.A) (the “Company” or “Yorbeau”) is pleased to report the final results from its 2017 winter drill program on its 100% owned Caribou project in Quebec. A drill program consisting of 5 drill holes totalling 3,477m has been completed with the objective of testing geophysical anomalies located 300m west of the known deposit and filling an important undrilled gap within the Caribou massive sulfides lens. Specifically, there was a 280m gap located between CAR-18 (0.9% Cu, 13.5% Zn, 0.6 g/t Au, 41 g/t Ag over 0.4m) and CAR-31 (0.4% Cu, 5.8% Zn. 0.3 g/t Au, 18 g/t Ag over 4.1m) which were drilled in 2010 and 2013 respectively (see attached Figure 1). Two holes were drilled in this gap, CAR-31W (wedge cut drilled from original hole CAR-31) and CAR-30 (deepening of CAR-30 drilled in 2013), and both intersected massive sulfides. At the depth of the mineralized zone in CAR-31W, the dip of the hole was at 53 degrees and the horizontal thickness of the mineralization therefore represents 60% of the core length. At the depth of the mineralized zone in CAR-30E, the dip of the hole was at 48 degrees and the horizontal thickness of the mineralization therefore represents 70% of the core length. The three holes that were drilled to test geophysical anomalies to the west of the Caribou deposit (CAR-34, CAR-34W and CAR-35) failed to return significant mineralization and the conductors were explained by pyrrhotite. The Caribou project is located in Northwestern Quebec approximately 95km NE of the town of La Sarre and is easily accessible via public roads and a forestry road that provides access to the former Estrades mine. The recent drilling took place along the western extension of the Estrades mine where exploration work carried by Cogitore led to the discovery of a new massive sulphide deposit in February 2009. Including the 2017 drilling, ten holes have so far intersected a thin but high grade massive sulphide lens (sheet) and the weighted average (by length of intersections) of the ten holes drilled to date on the Caribou lens is 2.8% Cu, 6.9% Zn, 1.1 g/t Au and 52.6 g/t Ag over a core length of 1.8 metres. 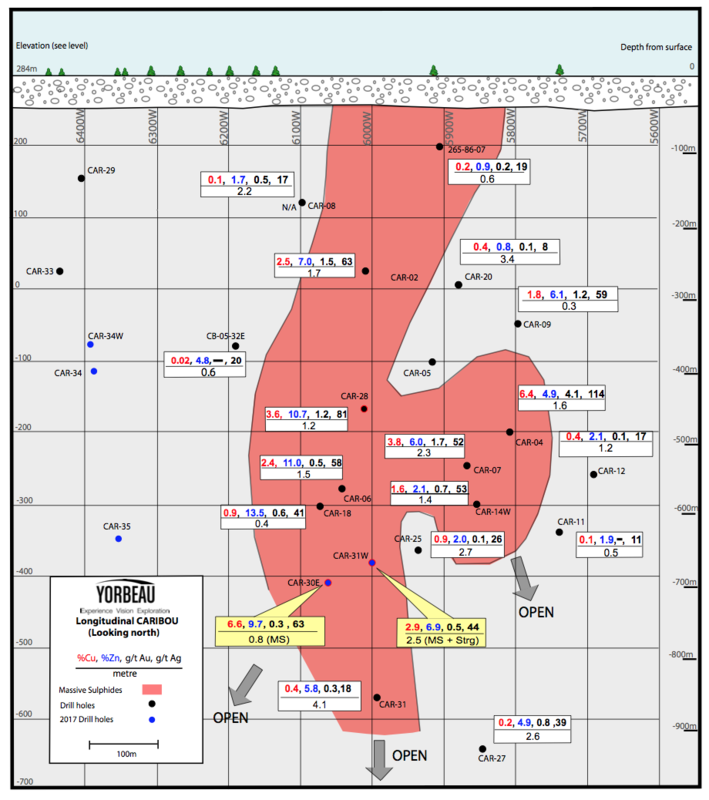 Company management continues to be encouraged by the persistent high grades intersected within the Caribou massive sulphides which remains open at depth (Figure 1). All drill core discussed in this press release was logged and marked up for assay at the Company’s secure facility in La Sarre, Quebec. Drill core for assay was split in half. Half of the core was shipped in sample bags with appropriate standards, duplicates and replicates used for quality control purposes. The other half of the core is retained for future reference. Samples were shipped to Laboratoire Techni-Lab S.G.B of Ste-Germaine. Work is carried out by the personnel of Yorbeau, under the supervision of Sylvain Lépine, P. Geo., M.Sc He is a qualified person (as defined by NI 43-101) and has reviewed and approved the content of this release. The Company’s 100% controlled Rouyn Property contains four known gold deposits in the 6-km-long Augmitto-Astoria corridor situated on the western half of the property. Two of the four deposits, Astoria and Augmitto, have substantial underground infrastructure and have been the subject of NI 43-101 technical reports that include resource estimates. The Company has signed an Option Agreement with an affiliate of Kinross Gold Corporation to pursue exploration on the Rouyn Property (see press release dated October 25, 2016). In 2015, the Company expanded its exploration property portfolio by acquiring strategic base metal properties in prospective areas of the Abitibi Belt of Quebec and Ontario that also feature infrastructure favourable for mining development. The newly acquired base metal properties include Scott Lake which hosts important mineral resources (see press release dated March 30, 2017).